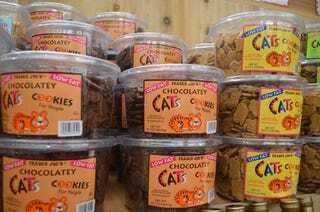 TRADER JOE'S CATS COOKIES—they're cookies. FOR PEOPLE. So yeah, TJ's cat-shaped cookies are my all-time favorite snack food EVAR. They're just amazing. AMAZEBALLZ! I mean, flavor-wise, they aren't anything special. They come in chocolate kitties (my favorite, NOMZ), ginger kitties, and plain sugar cookie kitties. Teddy Grahams probably taste better, to be honest. But there's something addicting about these. First of all, they're shaped like cute little cats. Second of all, they come in a tub. WHO DOESN'T LIKE COOKIES IN A TUB? Third of all, I love their tag line, "Cookies For People." Oh Trader Joe's, you're so witty! HOW COULD YOU NOT LOVE THESE THINGS?!!?!! My roommates used to make fun of me for my obsession with this stuff. But I will continue to love these forever and ever.